Artisans at the American leather goods label have been working out of the same Connecticut factory since 1975, and their time-tested techniques haven't changed much either. Before heading up the one-man design team in the brand’s New York offices, Formby had been following the label for years, window-shopping at its Madison Avenue boutique. “Ghurka is a quiet, sophisticated club to be in,” she says. (Tom Hanks and Francis Ford Coppola are fans.) And as a newly initiated member, her focus has been to enhance the collectibles, not reinvent them. She updated classic styles—known as the Original Collection—with fresh prints and colors, and introduced a stripe motif and new silhouettes. All the while, the tried-and-true construction, wear-tested since the company’s founding in 1975, remains untouched. Ghurka’s heritage traces back to its origin story: Founder Marley Hodgson happened upon the 100-year-old belongings of a British commander who had been stationed in India at an estate sale in the U.K. The leather aged beautifully—that kind of supple, perfectly beat-up aesthetic that can only be made with time. So he set out to create pieces that would not only last generations, but get better with each. Nobody carries on this legacy better than Luis Huerta, who owns the Norwalk, Connecticut, workshop where Original Collection Ghurka bags have been handmade from day one. (Other offerings are produced in Italy.) “There’s so much emotional history tying Luis to this brand because he was the first maker of it,” says product development manager Rina Jean Sfalcin, who credits Huerta as her mentor. “He’s taught me so much about quality manufacturing and construction techniques that are typically American, utilitarian, and built to last.” It could be said that Huerta learned something from the Ghurka tradition, too: He plans to one day hand the factory down to his son. Inside Ghurka's New York offices. A detail from Formby's vision board. Art from the Ghurka archives. Ghurka creative director Kathy Formby, a trained painter and former fashion illustrator, starts her design process by sketching a bag concept on a figure. “I like to get a sense of proportion,” she says. Her ideas are later presented to a team that decides which pieces will be made. Before an approved design goes into production, its dimensions are shared with the factory, which then sends a salpa (or a rough form) to the company’s New York offices. There, it’s marked up and corrected. This back-and-forth continues with leather samples until the piece is perfected. Formby sketching at her desk. A bag from Ghurka's fall collection that features Formby's camouflage-inspired print. The camouflage printed-twill Formby introduced with the fall 2016 collection. Tubes of paint used by Formby. Twill and leather are the mainstay materials of Ghurka bags. The durable twill mimics the fabric of bags from the ’70s and ’80s, which was originally used for industrial purposes such as filtering chimneys. “We really wanted to get back to that weight and stability,” says Sfalcin, who worked with an American custom textiles company to develop a material with a very specific structure, weave, and color. The process took a year and a half. In creating new prints, Formby applies her art background to the materials: The current collection includes a camouflage-inspired print that she painted. Leather skins laid out in Ghurka's Conneticut factory. Steel dies in the factory. Bag patterns hanging in the factory. A craftsperson handling cut leather pieces. Ghurka bags are made of French calf that comes from a 100-year-old tannery in northeast France. It’s an Aniline leather, meaning it’s dyed in a way that preserves the natural surface. Each skin has a different temper, and is carefully inspected to determine which part of a bag it should be used for. “[The factory owner] Luis lays out every skin and presses underneath. The firmer areas will go on the sturdier parts of the bag,” Sfalcin explains. Steel dies—or “cookie cutters,” as Sfalcin calls them—are made in accordance with bag patterns. These cut the leather into pieces that will later be stitched together. Cesar Aguilar, who has worked with Ghurka for five years, cutting leather. Leather trims piled up in the factory. Every piece of leather must be edge-painted by hand for a clean finish, a process that is time-consuming, and requires many steps: priming, dry sanding, applying another coat, and buffing each edge. After stamping a piece of leather. The Ghurka logo, which is stamped onto leather, was reimagined in 2012. 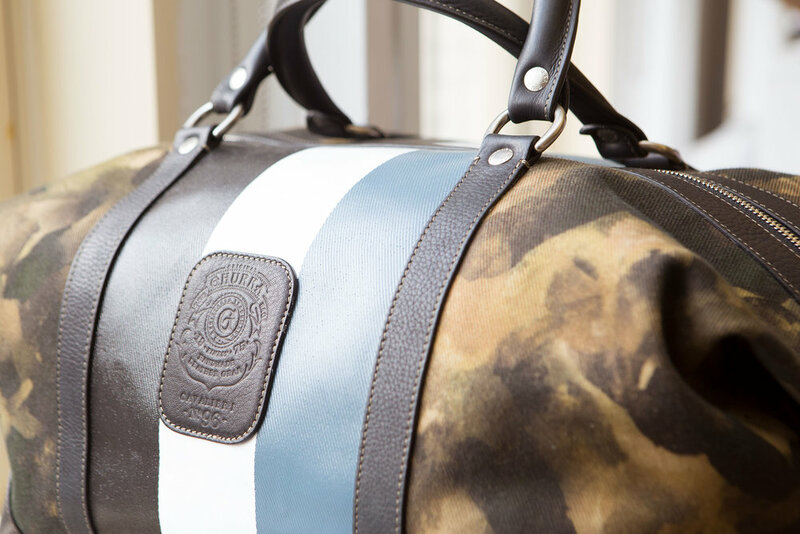 It includes a “G” inspired by Ghurka soldiers, and the bag’s style name and number, which corresponds to the order it appeared in the brand’s lineup. Longtime factory employee Milton Balarezo, who has worked at Ghurka for 25 years. The Blazer No. 278 backpack. Cut leather and twill pieces are sewn together with precision. “We have rules of thumb with the OC styles that are followed to a T,” Sfalcin says. These standards were set after years of wear-testing, and insure the bag’s best make. For instance, each binding must be 1 mm thick, and each bag has to be sewn with eight stitches per inch.